Christmas has been over for a few weeks now. Hopefully by now you’ve got your Christmas tree down, and your lights and ornaments packed away. But if that’s not you, and you still have your tree up, it’s probably getting to be about that time to pack it up. If you go the route of the artificial tree, clean up should be easy. 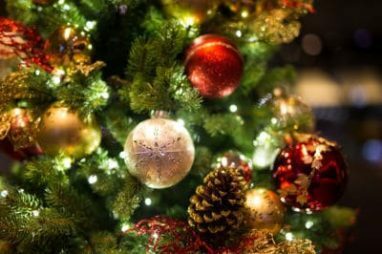 But if you’ve opted for a real tree, then it’s probably time to consider disposing of it before pine needles become a part of your living room décor. If you’re unsure on what to do, here are some tips for getting rid of your tree. Check with your city. Although every city is different in what they will take in recycling, they may offer a special program for a limited time for curbside pickup of Christmas trees. If your city has a yard-waste drop-off site, they may require you to transport your tree there. This may be the case if your city does not operate its own recycling program. Plant your tree. If you have a rooted tree, you can take it your yard and plant it right after Christmas. The tree will take root better in warmer climates, where you can more easily dig a hole now and not worry about frozen ground. If you live in the northern part of the United States and this seems like an interesting option, dig your hole ahead of time. Create your own mulch. If you have your own chipper, you can handle your own tree disposal. It makes for perfect mulch in your yard. If you don’t have a chipper, you can see if a friend has one, or can check your local big-box hardware store about renting one. Go in on a rental with several neighbors and you can keep your costs down. Make a bird sanctuary. Even if you don’t replant your tree, you can stand it up outside in your yard and add birdfeeders, fresh orange slices or pinecones covered in peanut butter and birdseed. Use it as pond feed. If you have a fish pond in your yard, cut your tree up and sink pieces into your backyard pond. The pieces make a great refuge and feeding area for fish. One thing not to do is burn it. According to Lowe’s, burning a pine tree in your fireplace or stove can cause flare ups and chimney fires due to elevated levels of turpentine oils that evergreens have. Also don’t wait until it’s dried out to dispose of it. The drier it gets, the more of a fire hazard it becomes. Remember, it’s important to not just throw your tree away. If it’s a real tree, then it’s biodegradable, which means it can be easily reused or recycled. Something else that can be easily recycled is your old or unwanted vehicle. Our vehicle donation program benefits children all over the country. When you donate a vehicle to Wheels For Wishes, proceeds from your donation benefits charities that help children almost everywhere in the United States. Your donation can help children all over. It is a great feeling, knowing that your donation is making such a big difference in the life of a stranger. Donating a vehicle is fast, easy and a decision you will not regret. Help a child in your own community by calling 1-877-431-9474 today or make your car donation online. Just a few minutes of your time can make a world of difference to a child.